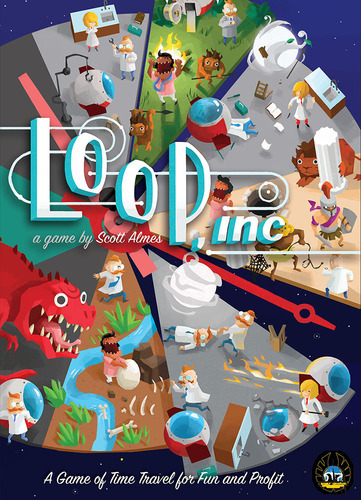 Scott Almes is back and we talk about Loop, Inc., The Great Dinosaur Rush, Bigfoot, & time travel. Here we go! Tom: First, how are the negotiations with the Elves Union going? Scott: Very well. I’m looking forward to a long, fruitful future working with the game design elves. Tom: That is very good news. So, what cons are you attending this year? Scott: Thanks to the generous backers for the Tiny Epic Galaxies campaign, I’m looking forward to a trip to Essen and helping the folks at Gamelyn staff their booth. Tom: That is super awesome news!! Gamelyn is such a class act. I need to get Michael on the ‘show’ soon. Hey, can we do an interview when you get back? Scott: Of course we can! This ‘an hour a day’ idea is one I need to implement. 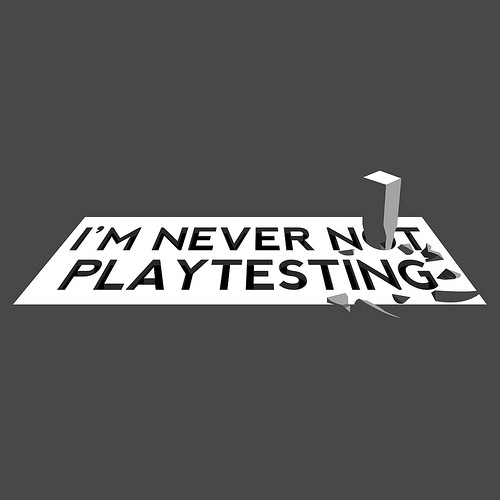 I’ve at least three designs at various stages and need to get something to playtesting stage. Scott: It’s a challenge getting into a schedule, and it took me a while to do so. It’s all about making design a habit. It’s like exercise in many ways – if you don’t make it a part of your week, then it’s not going to happen. If I don’t get design work done for a couple days I feel off and frustrated, which shows that it’s not a natural habit. For me, as soon as I get home from my day job, that’s when I do my game design work for an hour or two. I’m still in a productive mode, and that – for me – is the best time of day to tackle it. At the beginning, you have to force yourself into the schedule. But it’ll become natural soon enough. Tom: Ok. I kinda thought you would say something like that. I was hoping for a “go to this website and sign up for some elves” answer but this will do. I need more discipline. Your next game is Loop, Inc.. Talk about it a lot. What I love about this game is the ‘snowball’ effect of going back in time. I wanted something that, during play, felt like you’re actually messing with your timeline. It’s a unique game, and I don’t think it plays like anything else in your collection. The mechanics are very straightforward and the actions are simple, but the snowball effect makes it quite the brain burner. Tom: Man, that sounds like so much fun. I like a good time travel story and this sounds like it will make some cool ones. The ‘snowball’ effect is interesting. It’s like combo-ing but more complex I would guess. Who is publishing it? Scott: This’ll be my first game with Eagle-Gryphon games, and it’s illustrated by the fantastic Kwanchai Moriya. I’ll have a second game coming out with EG Games next year, called Island Hopper, which is a mix of auctions and dexterity. I’m really trying to make games that play different than others in your collection, and that’ll be another one. Tom: About Loop, can you give me a quick example of play. Scott: Definitely. So, the game is played over the course of three days. During the first day you might put an Advertising token on a Trip to take customers to Sail with Darwin on the HMS Beagle. Then you take two Shop actions in a row which let you add a Camera and a Net to your time machine. This lets you fulfill the trip with Darwin, and you send your time machine back in time. Each of these actions are represented from a card you take and lay in front of you. That’s a simple first day, and now you go back in time to the beginning of your first day. Now you have the time machine you came with (still outfitted with a Camera and a Net), but you also have the fresh time machine from the beginning of the day. You also have the hand of cards from your first day’s actions (Advertising, Shop, Shop) Now, for this second day, you get to take 3 new actions, but also have to complete your three actions from before. (So 6 total) And those actions (Advertise, Shop, Shop) must be completed in the same order. So, how do you plan your second day? Do you start off using old actions, or new actions? You lose points if you send a time machine on a trip with extraneous components, so you need to figure out what to do with a time machine that already has a camera and a net on it. You could use a move action, which switches components around. Or a trash action, which lets you remove components. After you complete the second day, you jump back to the third. Now you have three time machines, 6 old actions, and 3 new ones to take. Things have certainly snowballed! The actions are simple, but the decisions are tricky. Tom: Let’s talk about Bigfoot some. It’s a little known Scott Almes game. 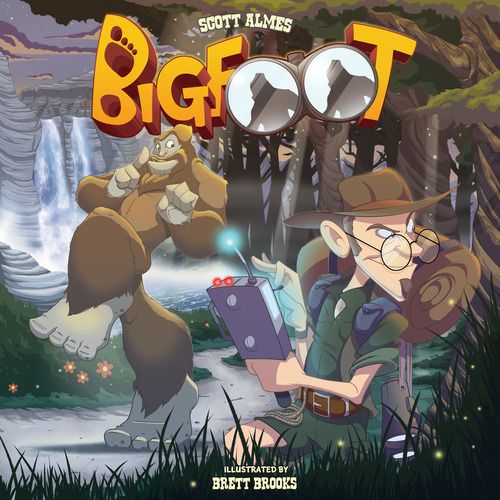 Scott; Bigfoot was released by Game Salute last year. It’s a small box, two player deduction game that takes 15 minutes to play. It’s asymmetrical, which is neat. One player is the cryptozoologist, who is trying to trap Bigfoot in his lair. The other player is Bigfoot, who is trying to stay hidden the entire game. The game features a cool ‘I cut – you choose’ mechanic. 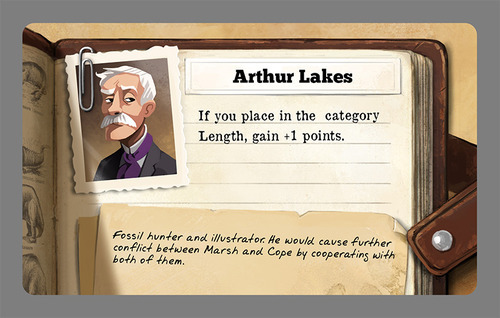 Each turn, the cryptozoologist lays out two paths, each loaded with traps and special actions. The Bigfoot must choose which path to take. When he takes a path, all the traps are triggered and gives the cryptozoologist clues. It’s quick and fun. Tom: I think I would like that. I should pick up a copy. I’m retheming Duck Blind to have a cryptid/paranormal theme. Talk about the next Tiny Epic family member. Heroes – This is the biggest new mechanic. Players now get a big meeple that serves that serves as their hero. Heroes have special powers, are upgradable, and you can retire them for points. Some heroes level up by spending resources, and others are forged through war. New Factions – In this expansion, winter is coming, and you’ll see some factions descend from the frozen north. Pigfolk. Polarbear warriors. Birdfolk. There is a lot here! If we fund high enough, it’s possible we could double the amount of factions that were in the base game. New Territories – Everybody likes more variability, right? You’ll see two new regions. The first is the Peaks, which allows players to collect the new resource, silver. And the next is the Tundra, which can only hold meeples in there temporarily, but allows them to collect any resource. War Towers – This is a cool, game changing addition. Each player gets more tower pieces, and the twist is that when players build a tower, they have to build it on the board. The tower track keeps track of your overall tower value, but the pieces on the board are the actual war towers. Which, if a space is invaded, these towers can be toppled and removed. War just got an upgrade! 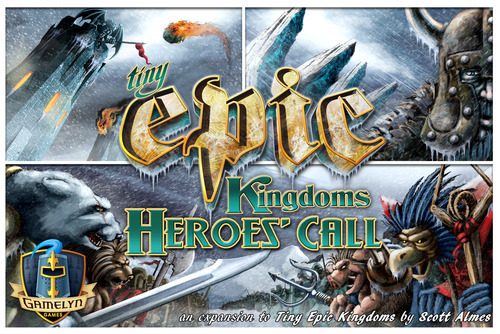 TEK: Heroes’ Call is coming to KS on June 22nd. And, please check it out. There is so much fun in this box. We’re dialing up the epic on it. Tom: This sounds pretty exciting. There’s been talk on the web just coming out about this. 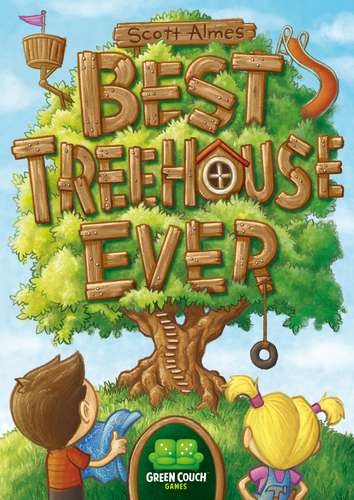 Best Treehouse did amazing on KS. Where are things with it? Scott: We’re just about to send the files to the printer. In fact, by the time this is posted they should already be in the hands of the manufacturer. I was really happy with how it did on KS. I’m especially glad that we got the stretch goal that allowed us to afford to do every room as a unique piece of art. Did you see what Adam did with these rooms??? Seriously, he’s one of (if not THE) best in the industry right now. Fantastic, fantastic work. I’m so happy with it. It was also the first time I got to work with Jason Kotarski, who is likely the nicest guy in the industry. I hope we get to do another game together in the future. I had a lot of fun developing BTE with him. I share his love for small box games that are easy to learn. Tom: You’re right. The art is fantastic. Adam is just killing it. It’s good news on the files. The game is moving along well. I really need to get Jason back on. He’s is cool. 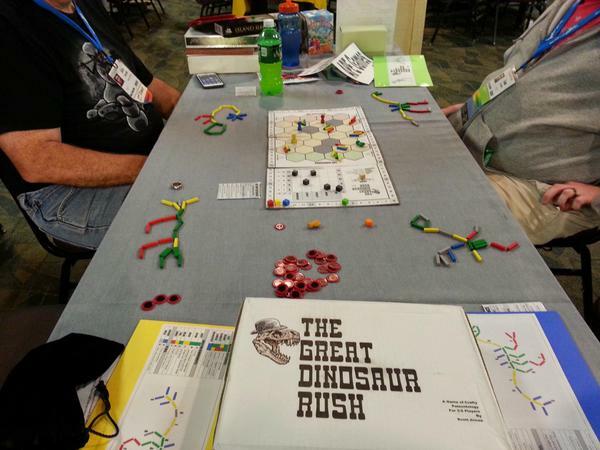 Ok, APE Games just announced that they are publishing another game of yours – The Great Dinosaur Rush. Give us the scoop on it. Scott: Oh, man, I am so excited to talk about this one! So, The Great Dinosaur Rush stemmed from my love for dinosaurs. It started when I was a kid (I briefly thought I was going to be a paleontologist) and I’ve had a love for fossils ever since. TGDR is my expressing that fascination with the prehistoric through a game. It’s themed around a very specific time period in paleontology. 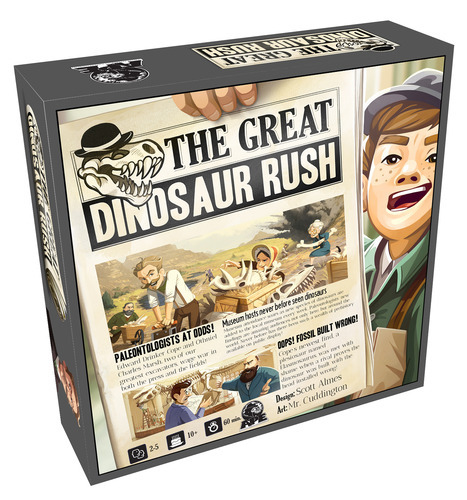 The Great Dinosaur Rush (or the Bone Wars) took place in the late 1800’s and was one of the most prolific periods of discovery in the field. 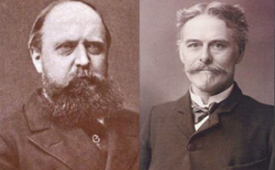 However, it was also a time period where two paleontologists, Othniel Charles Marsh and Edward Drinker Cope, brought shame upon their entire field. You see, they didn’t just dig up bones. They sabotaged each other, bribed away crews, dynamited dig sites, and slandered each other in the press – all in the name of being the best paleontologist in the world. This is considered one of the greatest scientific feuds in all of history. The only feud that rivals it is the war of currents. I mean, these guys were nasty. E.D. Cope actually requested that after his death his skull would be preserved and measured against his rival, O.C. Marsh, just to prove that he had the bigger brain. This time period was ripe for a game, and I was very driven to turn it into one. And, the result is – well – I hesitate to say it’s the game I’m the most proud of, but it’s one that is certainly a reflection of my quirky interests. The game players like nothing you’ve ever played. Seriously. I know a lot of people say that, but this is going to knock your socks off. In this game, you collect and build dinosaur skeletons to get points at the museum. Collecting bones is fairly straightforward, but you can take notorious actions to make collecting easier by dynamiting or stealing bones from other players. When you do this, you get a notoriety token with a secret value. At the end of the game, the player with the most notoriety loses points. So it has a nice push your luck feel. But, it’s once you get these bones that things get really interesting. The bones are wooden pieces that you use to assemble the skeleton. Skeletons must follow a simple set of rules, but other than that are pretty freeform. That means you get to let your creativity flow while building these dinosaurs. No dinosaurs will ever look the same. This part is just FUN! Of course, there’s strategy to it. When you finished your skeleton, there are rules for how you compare them against each other. Which dinosaur is the most fierce? Which is the tallest? The longest? TGDR is very unique, and I can’t wait until it comes to KS. It has creative play, a historical theme, a cool notoriety mechanic, and hidden underneath the hood it’s driven by fair eurogame sensibilities. And, the art is going to look fantastic. APE is doing such a good job with the game! Tom: I really like how this sounds. I’ve always loved dinosaurs so this is striking the right chords with me. I know a little about this subject and you are right. It was ripe for a game. The notoriety mech is cool. Can you explain it a bit more? Scott: Definitely. In the historical Great Dinosaur Rush, these paleontologists brought shame on their entire profession. So, I wanted to make sure that this was a central mechanic in the game. Basically, your turn while collecting bones goes: 1) Collect bones in the space you are in, 2) Move, and 3) Take an Action. The notoriety part comes with 3. There are some good actions (Promote a museum category which puts more points up for grabs, publish a paper, or donate bones) and then there are three notorious actions. The notorious actions (Steal, Sabotage and Slander) are more powerful, but they come at a price. You gain a notoriety token, which is worth 1-3 points. This is hidden from the other players. At the end, everybody reveals their tokens. The player with the most loses those points. The other players GAIN those points. So, you want to have a lot of notoriety (and benefit from the fame) but not enough to bring shame upon your name. It’s a little group-thinky, push your luck, and a quite fun element to the play. Scott: What I’ve learned from playtesting is the ability to read between the lines. When a playtester asks a question or gives a suggestion, there’s normally something in your game that they felt was lacking. Take their question or suggestion, but also try and figure out the driving force behind it. For example, if you are designing a dice-based euro game, and a player says “I wish I had more dice on their turn”, the answer might not be as simple as more dice. What they are looking for is doing more on their turn, or to make their turns more meaningful. The solution could be more dice, sure, but you might need to make your actions more powerful, reduce downtime so turns come quicker, or making put in some simultaneous play. Tom:How do you decide this? What’s good, what’s not good advice? Scott: I like to point out Power Grid, because you can see how the mechanics intertwine during play. It has variable turn order, a self-balancing market that factors in supply and demand, a ‘step’ mechanic that ramps up the game towards the end, and a cutthroat auction. When you play, really focus on how the mechanics are working together, and what the do to benefit the game. Look at how the market’s fluctuations affect play. Watch how people take turn order into consideration as they grow. There are a lot of subtle things here that are great for a game designer to pay attention to. Tom: What do you like to do when you’re not playing or designing games? Scott: Spend time with friends and family, of course! I’m also a big reader and I love to write. I’ve had short stories published before, and would love to get a novel published in the near future. Tom: What other geeky stuff do you like to do? Scott: I love movies, especially quirky, indie science fiction films. Movies like “Safety Not Guaranteed”, “The One That I love”, and “Primer” are all awesome in my book. I love seeing the surge of low-budget, high concept sci-fi. Tom: I like those types of movies also. “Primer” is amazing. I’ve not seen the other two. Yet. Remind us how to contact you. Or, I’m on BoardGameGeek all the time, and my username is “scottbalmes”. Scott, it was awesome talking to you again. I’m very excited about all your up-coming games. 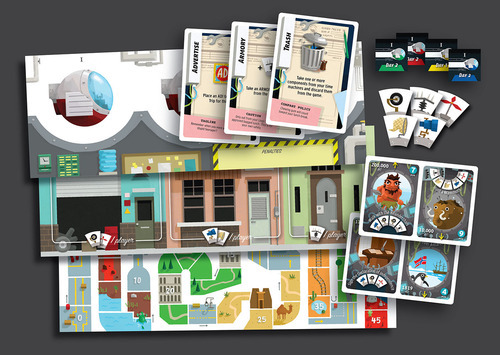 Readers, please keep your eyes open for Loop, Inc. and The Great Dinosaur Rush coming soon to Kickstarter. Feel free to leave a comment here or on Twitter #goforthandgame. Thanks for visiting.